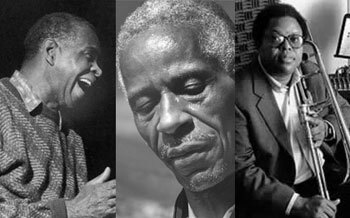 That was the outcome of the cage match Saturday night between three legends of Chicago’s avant-garde jazz scene and listeners at the palatial Riverrun Centre in Guelph, Ont., home of an annual jazz festival that’s extremely adventurous for one in a town of its size. Amid its atmosphere of almost ostentatious open-mindedness, they discovered limits. The trio was the back half of a two-part headlining show in the festival. Before them came Sangam, another trio featuring the venerable Charles Lloyd, titanic Indian tabla master Zakir Hussain and hot younger drummer Eric Harland. Their sound ambled joyfully and contemplatively, sometimes goofily, through the fields of post-bop, “world music,” free jazz and more, with a strong sideline in esoteric spirituality, all to the rapture of the Guelph crowd. Then Mitchell, Lewis and Abrams took the stage, looking respectively like a shrunken-suited character out of Samuel Beckett, a genial grandpa and a tough old cuss. You could imagine them together in rockers on the retirement-home porch. Sax, trombone/laptop and piano were their props. Stage positions were taken. An intake of breath. And then an incredible mass of noise. I wondered if the programmers had known what they were in for. Usually music this far “out” is at a church hall, an art gallery or some sort of loft space. You’re not in a lush theatre with a state-of-the-art sound system. The result was that there was none of the usual diffusion of intensity by space. I was in a balcony not far from the speakers. At times I thought I might have a panic attack. With rare exceptions the performance was all about timbre and dynamics. Notes, chords or rhythms were rare visitors. In other words, these three senior citizens were playing the kind of noise set you’d expect from bearded kids in a basement in Brooklyn. It was purist. It wasn’t humorous (except for a few of the sound effects Lewis generated from his Mac, I suppose). It did not have an arc that was building to an intensity, trying to “find the zone” as improvisers often say, because it started from there – as if these three men carry that zone around with them everywhere. Of course they’ve all played other kinds of music, but many audience members might not have guessed this. It was militant. What it was militant about was, in a way, old-fashioned: It was modernist. It demanded the audience come on its terms. You had to decide whether this was music at all. You had to figure out for yourself, unaided, why anyone would consider it attractive. I had a couple of flashes of a joke Stephen Colbert has done a couple of times when John Zorn or Ken Vandermark have won grants or prizes, and he plays 30 seconds of skronk and starts grinning manically and snapping his fingers as if it were a swing tune. When the remaining diehards had, defiantly, kept applauding for more, I considered calling it a night. But then Mitchell created a taut structure for the next improvisation – a harsh single note sustained, followed by silence, then again, and again. Abrams jitterbugged chromatic circuits around these poles, while Mitchell’s Mac generated complementary cumuli of static. Then he rose and picked up his trombone (I winced in anticipation of another existential workout), raised it to his lips – and put it down again, the encore falling dead after Mitchell’s stubborn conclusive note. I laughed with appreciation, but also relief. At points, when the sound wasn’t driving down circuits of muscle and nerve that risked making me burst into tears, I thought it was a museum piece. I still think that if it had been three young guys doing it, it would have seemed absurdly retro. But from these three, who’d had to fight for their freedom on many levels and had built a practical and still-living artistic community on it, it moved me. Integrity trumped superficial artistic “progress.” Yet anger seemed the prevailing electromotive force. Did it have to do with the portentous date? The disappointments of Barack Obama? The yahoo pastor in Florida with his Koran and his lighter fluid? No, it seemed off, somehow, to consider this energy exactly political. Maybe instead it had to do with the drunk driver who, not long before, had spun out in the rain and plowed into the back of the “jazz parade” that a genial Quebec oom-pah band had been leading from the festival tent downtown, and injured five people (none critically). Or … not a protest, nor a mourning. No referential content at all. Perhaps it was instead a technique not that far from Sangam’s meditation-and-oneness concerns – a means of fully inhabiting a moment. Can you really let go of suffering, or do you turn on it and annihilate it? Think of shamans who reach higher planes not by dancing or chanting but by whipping themselves, even slashing themselves with knives, or returning from the forest starved and hungry. Not everything worth having comes gently. It is not always generous to be easy on people. You can ask a lot if you’re giving everything. In the end, while not a lot of fun, it’s a concert I’ll remember, unlike most. It’s a memory burnt black and rain-battered and space-race (race-space) gold as a saxophone in a spotlight. In the “sonic eye” of my mind, it’s the colour of nothing but itself. Itself, and a mountain that can never truly be climbed.